I had a pack of that in my pantry and when I move, I had to throw almost a full pack away :( Well, I don't bake but still keep a pack in case I need some "coating" for deep-frying stuff sometimes. Ah yes. Right now I'm trying to remember which cannister contains all-purpose flour, and which cannister contains self-rising cake flour. I guess I'll have the answer when my cake ends up like a hockey puck, or my gravy expands three-fold! I burst out laughing with your first sentence!! I go through an alarming amount of AP flour even as I am trying to reduce my use of it. Those latkes sound sweet! That is something I always have around, Lydia - really important in my pantry! Sweet potato pancakes -- excellent idea. Keep getting sweet potatoes in my CSA box and need new ideas to cope! I am devoted to King Arthur. I love their flours and baking products. I'm currently digging Barley Flakes, which can be used the same way old fashioned oats can be used. My family had a Hannukah party this past weekend and I made sweet potato pancakes as well as regular potato pancakes and zucchini pancakes (with an Asian flair - rice flour and scallions). I added mashed bananas to the grated sweet potatoes, along with grated onions, egg, a bit of whole wheat flour and S+P as well. They were delicious! Happy Hannukah tonight to those who observe. Oooooooooooooooh! I've got all the ingredients! I've been planning to roast the sweet potatoes, but I may have to shift gears. If not, will the recipe work as written with plain ol' russets? I love sweet potatoes! I've often wondered why I don't see them on restaurant menus more often. I guess they're more like "home food." They're so delicious. And thanks for the explanation of all-purpose flour. I'm just now getting into baking in a little more depth, and suddenly realizing that all those terms for flour actually mean something. They're not just willy-nilly names. Your recipe was so delectable sounding that my boyfriend just emailed it to me. I think that was his not so subtle way of asking me to make him these for dinner. Thank you for the great recipe. I look forward to trying it out soon. Tigerfish, flour is wonderfully inexpensive, so if you ever do decide you want to bake something, you can buy a very small bag and start again. It's hard to know what to take to a new kitchen. TW, forgetting to label the flour is something you only do once, like rubbing your eyes after you cut a jalapeno. For me, it's critical, because most of my baking ends up like hockey pucks. Fortunately the Drop In & Decorate cookies are the one thing I've learned to bake -- with this all-purpose flour. Lobstersquad, he is cute, isn't he? Nupur, for someone who doesn't bake, I go through a lot of flour, too. We never ate sweet potato latkes when I was growing up, but I do love them now. Patricia, it's a staple for me, too. Have you tried white whole wheat flour? That's my new thing -- I love it. Paz, I have to tell you -- these are really addictive!!! Christine, when I was growing up, sweet potatoes were always things that came with marshmallows on top, and that was always too sweet for me. So it's only recently that I've become a fan of them again. Sharon, Asian zucchini latkes? I'm hooked -- what a brilliant idea! And I haven't tried the King Arthur barley flakes yet, but I'm intrigued. Jerry, absolutely yes -- delicious with plain russets, though I use sage as the seasoning when I make them. Hanne, I agree about sweet potatoes. I think they are so delicious. We used to get the best sweet potato fries at a little barbecue stand here in Rhode Island, but I don't often see them on restaurant menus. I love sweet potatoes with black beans in stew, too. Erin, these are so easy that your boyfriend could make them -- for you! Enjoy! Oooh, those sweet potato latkes sound good! I have 2 kinds of flour: all-purpose (I think) and whole wheat (I think). I was just thinking that sweet potato latkes would be a fun thing to make this weekend...and now I don't have to invent a recipe! I've never had sweet potato latkes,sounds great. And thank goodness they now sell King Arthur in the grocery store. Love it. Jennifer, glad to help! I've also made latkes with mixed sweet potatoes and russets -- those are delicious, too. Sher, not only does my little grocery store sell King Arthur all-purpose; they're also getting into selling some of the organic and specialty flours. I was surprised, and delighted, the first time I saw so many products on the shelf. Just a quick comment that I nominated you for the Best Food Blog - Theme. All the best! p.s: I've heard so much about King Aurthur flours. Lydia, I love Hanukkah because of all the potato pancakes! I have yet to try sweet potato pancakes though because I'm too caught up on regular potato pancakes :) Sorry again about the mistake earlier! Nora, I'm honored. Thank you so much. Hillary, how about half-and-half latkes? Half sweet potato, half russet -- they're beautiful and delicious. Stacy, thanks -- Chanukah is my favorite holiday. Happy holiday to you, too. Sweet potatoes seem to appear very very often on our table. Not long ago I started doing half and half hashbrowns and just love them. 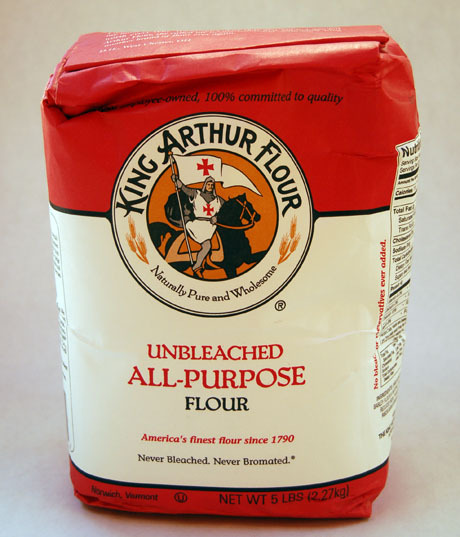 I am delighted that the Kroger carries so many of the King Arthur flours! MyKitchen, the half and half hash browns sound great -- I'll have to try that. My little local grocery store is carrying a better selection of King Arthur Flour products, too, and also Bob's Red Mill, which sells an amazing range of grains. Hooray for whichever distributor is bringing these things to the smaller groceries. I love all purpose flour. I only need one type of flour and done, I can make any kind of cooks. Latkes is my favorite side dish. I love it shredded with hands because they turn into long cut size. Thanks for this great recipe.